Ciara Mageean clinched the 800m title at the Irish Championships as Emma Mitchell completed the 5000m/1500m double at Santry. After a fast first lap Mageean tired in the closing stages as her time of 2:04.16 left her only 0.17 seconds ahead of Naas's Claire Mooney. Queen's athlete Mitchell earned a dominant 1500m win in 4:31.56 after her 5,000m victory on Saturday. Other NI winners included Amy Foster, Kerry O'Flaherty and Adam McMullen. Foster ended an emotional week as she took the women's 100m title in 11.43 following the death of her grandmother. Her time - only 0.03 outside the Irish record she jointly holds with Ailish McSweeney - left the City of Lisburn athlete 0.26 ahead of Niamh Whelan. O'Flaherty won her first Irish senior outdoor title since 2011 as a potentially exciting duel with fellow Rio Olympian Michelle Finn petered out when the Leevale athlete took a tumble over one of the barriers with 700m left. Finn had forged a 10-metre lead with three laps to go but appeared to be beginning to struggle when she hit the deck on the second last lap. O'Flaherty crossed the line in 10:01.40 with Finn almost half a minute back in second place after getting back on her feet. Mageean's race was her final outing before her 1500m challenge at the World Championships in London. "I ran a little bit too fast over the opening 200m - 28 seconds instead of 30 which I had been told by Jerry (Kiernan)," Mageean told RTE. "I felt comfortable. I just wanted to go and have a good hard race," although the Portaferry woman acknowledged after watching the race replay that she was unaware Mooney had been quite so close at the finish. After arriving at the championships having never won an Irish senior title, Mitchell headed back home to Banbridge with two gold medals as she continued her brilliant summer. The closing stages were a carbon copy of Saturday's 5,000m as Mitchell put her foot down with 600m to storm well clear. Amy O'Donoghue reduced Mitchell's lead in the closing stages but the Commonwealth Games contender still maintained her form sufficiently to have 1.03 seconds in hand at the finish. "It's been a great season. 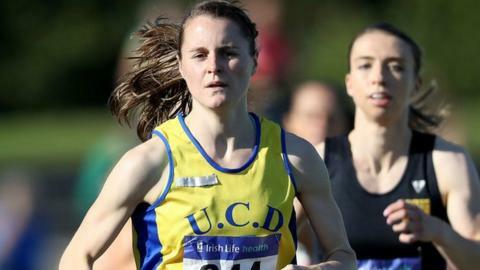 I've got the Commonwealth Games consideration times in both the 5,000m and 10,000m and I know that I'm strong, fit and fast," added the Queen's student, who will represent Ireland at the World University Games in Taipei next month. County Londonderry long jumper McMullen continued his consistent summer form as he took victory in 7.74m, with his series also including a 7.70m leap. Letterkenny man Mark English won the men's 800m title in 1:50.89 ahead of Kieran Kelly (1:52.07) and Karl Griffin (1:52.44). Dubliner Brian Gregan continued his impressive summer by winning the 400m title in 45.74 seconds while Rio Olympics fourth placer Thomas Barr showed encouraging form after injury as he won the 400m hurdles in 49.79. Both Paul Byrne and Northern Ireland Commonwealth Games athlete Jason Harvey put it up to Barr but the Waterford man pulled clear in the closing stages. Frustratingly, Byrne was again outside 50 seconds as he clocked 50.24 while Harvey took third in 51.19.